Rescue poles are widely used in the electrical work environments to remove casualty from the danger area in rescue operations. 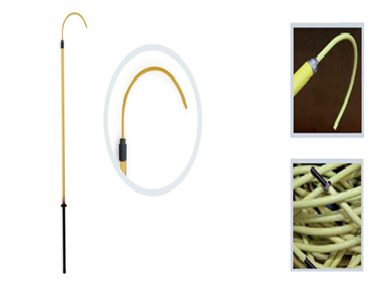 We are offering a wide range of insulating rescue poles to be used in the high voltage or electrocution situations. The rescue poles that we are offering are made of polyester and 32 mm fiberglass tube with humidity-proof seals on each end. It consists a hand protector grip, a tip, M-10 metric head and a rescue hook. Its robust construction and strong material make it strong enough to easily drag a fully grown up man from the danger area. Insulating platforms and insulating platforms and boots along with Rescue Poles complete the set of the rescue kits. We have set up a vast distribution network in order to meet the requirements of the clients within the stipulated time frame. Feel free to get in touch with us for purchasing Rescue Poles at competitive prices.